He was a son of Wisconsin, born and bred, where his parents’ families had moved in the 1850s and 1860s via western Pennsylvania, Ohio, and Indiana after several generations of steady westward migration. His American roots on both sides of his family lay in the South — Virginia, North and South Carolina, Georgia, Alabama, and Tennessee — and went back to the 1600s. His ancestors included Quakers, Tories, a Civil War veteran, and virtually every strain of pre-Revolutionary Anglo-American. His father, Lyman Z. Smith, himself had been born in Wisconsin and Lyman’s father, Zachariah, in Ohio. In 1855 Smith’s grandfather Zachariah moved from Indiana to Wisconsin. The Smiths were instrumental in founding the Sugar Grove Church of Christ. The congregation got going in 1855, and Zachariah later donated land for the present building. Some seventy years later his grandson Gerald began his ministerial career in a nearby Church of Christ in Soldiers Grove, and various cousins of Gerald have served in the ministry almost without a break ever since. As was typical in rural Wisconsin around the turn of the last century, Smith’s formal education began in a spare, one-room schoolhouse without indoor plumbing. The school was about a mile northwest from the Smiths’ equally spartan four-room house in Richland County. By the time he was nine, Smith claimed to have memorized the lessons through grade eight. Smith said that he soon outgrew the rural school and persuaded his parents to let him attend the better schools in Viola, about seven miles north. He remained there through his freshman year. The Smiths moved to Viroqua, where the schools were larger and better, although they did not sell the farm. Young Gerald seemed to have found in high school his future as an orator and speaker. His “Senior Superlative” in the annual called him “the most talkative.” As a newcomer to Viroqua in his sophomore year, he was elected class president. Along the way to graduation in 1915, he was president of the school’s literary society, business manager of the 1915 annual, “yell master” for the sports teams, Duke Orsino in Shakespeare’s Twelfth Night (the senior class play), a member of the track association in his junior year, a performer in the minstrel show, a soloist in the glee club, and a standout in oratory and debate. In oratory in his senior year, he took first place in the league contest at Sparta, delivering William Jennings Bryan’s famous “Cross of Gold” peroration “with the fire and eloquence of a Daniel Webster.” For his senior annual, he wrote essays about school spirit and a thirty-below-zero basketball excursion to Viola. In short, he was a high school success, and he graduated from the German-language sequence (the school offered several language-based courses of study) with a class of twenty-four on June 4, 1915. In the fall of 1915 he entered college — Valparaiso University in Valparaiso, Indiana, then known as “the poor man’s Harvard.” Smith made his way by mowing lawns, washing dishes, waiting on tables, and serving a small congregation in nearby Deep River, Indiana. Valparaiso was basically a two-year, degree granting school, and Smith received a bachelor of oratory degree there in August 1917, having taken additional classes in religion. In January 1920, he accepted a pastorate at Footville, about ten miles west of Janesville. There, too, he quickly became a success with his preaching. “Bro. Smith preaches the gospel plainly week after week, but the people seem to delight to hear it,” so much so that within a year the small congregation had grown by 125 members. Articles about him and his work appeared regularly in the Disciples of Christ official publication, the Christian Standard. While at Footville, Smith met a strikingly attractive church singer from Janesville, Elna Sorenson, daughter of a middle-class, devout family. Elna and Gerald dated for a year and then were married on June 21, 1922. A quiet, modest, beautiful woman, Elna supported her husband in all of his political crusades, a true helpmate who made his priorities her own. Over the course of their fifty-two-year marriage, Elna Smith would give birth to their son Gerald, Jr. (Gerry), work the crowds at Smith’s speaking engagements no matter how many protestors were present, and serve as an associate editor of many of his publications. By the time of his marriage, Gerald left Footville and became the pastor of a newly organized congregation in Beloit. While there he accepted a speaking engagement at the denomination’s national congress in St. Louis, he spoke about how to overcome difficulties in a rural church setting. The talk proved to the body’s national leaders that Smith possessed exceptional oratorical gifts, and thereafter his career took off. He then moved to a church in Kansas, Illinois, where he stayed a year; then in late 1923 he accepted a call to a church in one of the denomination’s most important strongholds in Indianapolis. He was only twenty-five. His ministry there abruptly ended in 1929 when Elna was diagnosed with tuberculosis, and doctors urged the couple to move away from the coal - infused air of the midwestern industrial city. Although Smith considered offers to relocate in several locations, it was the discovery that Shreveport Louisiana had an excellent reputation for tubercular convalescence that made the choice clear. Smith’s original plan was to remain in Louisiana only for the amount of time Elna needed for a full recovery. He had no idea that this decision would land him in a place where his rhetorical skills would carry him from the pulpit to the national political lectern. As before, he proved an effective pastor, adding new members and raising money. While trying to help several members who were facing foreclosures, Smith met the Louisiana politician Huey P. Long. As governor and then U.S. senator, Long was the most powerful politician in Louisiana’s history. Smith later said that the banker who wanted to foreclose was a Jew. His position on the Jews arose from his fervent Christianity which inclined him to view Jews as the enemies of Jesus. Smith soon left the ministry which was brought about by his growing public association with Huey Long, and his support of the politician’s agenda that alienated the wealthy and conservative board members of Smith’s church. Seven months after arriving in Louisiana, Smith left his Shreveport church, and he never returned to the pulpit. Smith loved the work, and he thrilled rural audiences with his oratory. Farmers and merchants flocked to his speeches and joined clubs. He exhorted them to “pull down these huge piles of gold until there shall be a real job, not a little old sow-belly, black-eyed pea job but a real spending money, beefsteak and gravy, Chevrolet, Ford in the garage, new suit, Thomas Jefferson, Jesus Christ, red, white and blue job for every man.” Those who signed up for the local clubs received membership cards and became part of Huey Long’s growing mailing list, and by 1935 there was 27,000 clubs with a membership of 4,684,000 and a mailing list of over 7,500,000. Smith had a program: impeach all traitors including FDR, deport Jews and blacks, repeal the income tax, outlaw communism, and make America, capitalism, and Christianity synonymous. Following Long’s death, Smith found a new ally in Dr. Francis E. Townsend of California. Townsend, like Long, had a panacea for the Depression. It was called the Townsend Recovery Plan. Smith, joining the board of directors, raising money, and organizing a youth corps. The Townsend-Smith alliance gained momentum. The movement needed Smith’s youth, vitality, and charismatic oratory. Father Charles Coughlin was also on the scene. Coughlin was a formidable figure. A Catholic priest with a large congregation in suburban Detroit, he had the largest radio audience in the nation. More people listened to “the radio priest” than to Roosevelt or to “Amos ’n’ Andy.” Coughlin had broken with Roosevelt after initially supporting him. The priest thought Roosevelt was planning to drag America into WWII. 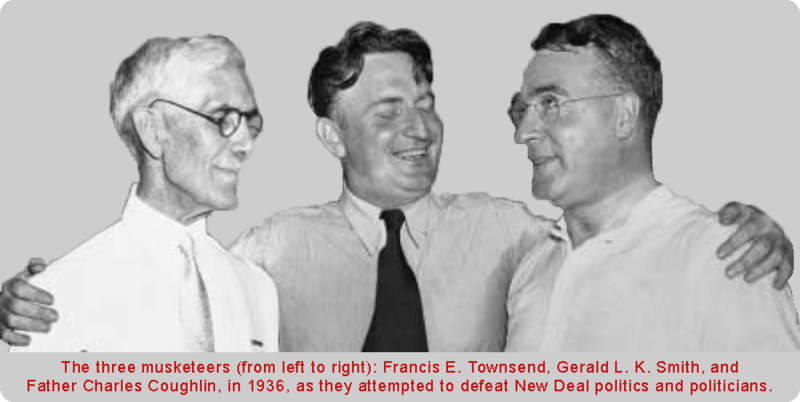 The 1936 presidential campaign brought together Smith, Townsend, and Coughlin in the Union Party. Their united following was enormous and fanatical, and Smith and Coughlin were the most eloquent public speakers in the nation. None of them was a credible candidate; Coughlin was a priest born abroad, Smith had no political experience, and Townsend was a septuagenarian. They therefore selected a candidate who seemed to be an amiable politician, William Lemke of North Dakota. The Union Party effort failed. It spent only $95,000 while the Republicans spent $14 million, and the Democrats, $9 million. They could only do little grassroots organizing. They made no overtures to organized labor. Roosevelt’s New Deal had worked no miracles, and the economy had not improved even though they kept espousing a propaganda of hope. Voters believed the FDR fiction of hope could deliver while the Union Party's plan could not, so the depression continued. 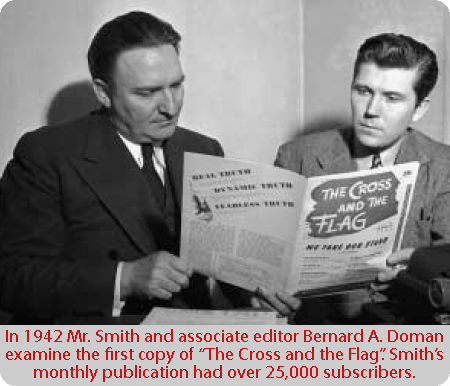 Smith not only continued to speak but also began to write hundreds of tracts, pamphlets, and books, and nearly every word of a monthly magazine, The Cross and the Flag, which he began publishing in 1942 with twenty-five thousand subscribers. His writing, like his speaking, was concise and hard-hitting, identifying and denouncing villains, and praising men of character fighting for the right. His adjective-laden sentences with their hard hitting analogies and humor was hateful to all liberals. He was living in a world controlled by far left villains and jewish conspiracies. A workaholic, he wrote skillfully crafted articles with assembly-line consistency. Also in 1942 he founded the political action group, the Christian Nationalist Crusade. In 1940 Smith became associated with the America First Committee. It soon became the most powerful isolationist group in the United States. The America First National Committee included Robert E. Wood, John T. Flynn and Charles A. Lindbergh. Supporters of the organization included Gerald L. K. Smith, Burton K. Wheeler, Robert R. McCormick, Hugh Johnson, Robert LaFollette Jr., Amos Pinchot, Hamilton Fish and Gerald Nye. The AFC had four main principles: (1) The United States must build an impregnable defense for America; (2) No foreign power, nor group of powers, can successfully attack a prepared America; (3) American democracy can be preserved only by keeping out of the European War; (4) "And short of war" weakens national defense at home and threatens to involve America in war abroad. The AFC influenced public opinion through publications and speeches and within a year had over 800,000 members. However, the AFC was dissolved four days after the Japanese Air Force attacked Pearl Harbor on 7th December, 1941 which was due to Roosevelt’s threats of trying all the members of the AFC for treason. Smith barnstormed the nation in the 1940s, crusading against communism, the “Jew-infested” United Nations, and the Truman Doctrine, the Marshall Plan, and NATO. He moved his headquarters to St. Louis in 1947, to Tulsa in 1949, and to Los Angeles in 1953. He appeared in public infrequently in the late 1950s, but in the 1960s he began constructing what he termed his “Sacred Projects” in the Ozark hamlet of Eureka Springs, Arkansas. A prosperous spa in the 1890s, Eureka Springs was economically dead until Smith began his projects there. He bought a Victorian house called Penn Castle in 1964, renovated it, and made it his summer home. In 1966 he constructed and dedicated the “Christ of the Ozarks,” a seven-story cross-shaped statue of Jesus that is half as tall as the Statue of Liberty and twice the size of the well-known “Christ of the Andes” in South America. It still stands in Eureka Springs, weighs 340 tons; the face is fifteen feet high, and the hands are seven feet long. Smith’s Sacred Projects revived the economy of Eureka Springs, and he became a local hero. The community expanded its restaurants and hotels, and other entrepreneurs moved in. By 1975 Eureka Springs was the leading tourist community in Arkansas, and Smith had bigger plans yet. He planned to construct a replica of the Holy Land, including the Sea of Galilee, the River Jordan, and scenes from the life of Jesus. Visitors could even be baptized in the river. Smith’s new Holy Land, slated to cost $100 million. However, only the Great Wall of Jerusalem had been completed in 1976 when Gerald L. K. Smith died of pneumonia at age seventy-eight. Smith was buried at the feet of the “Christ of the Ozarks”. His Sacred Projects were his great joy. Through the last four decades of his life he had continued to publish The Cross and the Flag and write thousands of tracts. Even after four decades has past since his death, the far left jew controlled media still attacks this force for truth.